Okay…so what the heck is mouse hand? Yes, I know it sounds ridiculous! Mouse Hand. My wife was mentioning that she heard this term ‘mouse hand’ from some colleagues. These colleagues were complaining that their wrists and hands were hurting from typing reports all weekend. They said that they had mouse hand. I did some background research on this topic and did not find much written on the slang term “mouse hand” solely. What is MOUSE HAND in medical terms? Well, simply put, mouse hand is a repetitive strain injury to the wrist/hand area. 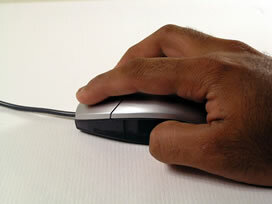 In the case of mouse hand, the wrist and hand becomes strained/sprained when using a mouse for lengthy periods of time. They also complained of tightness, stiffness, decreased wrist range of motion as well as swelling at times. I would imagine that individuals who are constantly using a computer with a mouse (bloggers, computer technicians, web designers, etc. ), would experience this type of condition. It is amazing that as our world changes and as it becomes more technologically advanced (2oth and 21st century changes), new musculoskeletal medical conditions come about. As our job tasks change, so do our injuries and how these injuries may come about. For instance, let us talk about the chauffeur fracture. The name originates from early chauffeurs who sustained these injuries when the car back-fired while the chauffeur was hand-cranking to start the car. The back-fire forced the crank backward into the chauffeur’s palm and produced the characteristic styloid fracture (forearm fracture). It is also known as a backfire fracture (for the same reason) or a Hutchinson fracture. Today, this fracture occurs, however not due to cranking cars. Instead, it can occur if someone falls on an outstretched hand. Let us get back to Mouse Hand. I have found a couple of threads on the topic of mouse hand and noticed that some individuals have found ways to prevent and overcome these symptoms of mouse hand (pain, tightness, decreased range of motion and discomfort in the wrist/hand) by simply switching over to using an IPAD or device that does not require the use of a mouse or constant use of their wrist. Others mentioned doing hand/wrist exercises or taking frequent breaks during long periods of computer/mouse usage. These techniques both make a lot of sense to me. Mouse Hand is in medical terms a repetitive strain/sprain injury, overuse syndrome, or carpal dysfunction. What is this, you ask? Well, our wrists consist of 8 carpal bones. Sometimes these little 8 bones move out of position slightly, spraining the ligaments that attach one carpal to the other. If this occurs, this causes pain, stiffness and decreased motion in the wrist – dysfunction. Many patients present with these symptoms – they may not call it mouse hand but they realize that they have injured their wrist. What happens to the soft tissues in the forearm? In order to function properly, muscles (and other tissues of the body) require oxygen, which is carried by blood. When muscles are overused or overworked, which may be the result of over-training or performing repetitive motions, blood supply to muscles is reduced (tight muscles squeeze blood vessels thus decreasing flow). This places the muscle in what is called a hypoxic state. Simply stated, the oxygen supply required by the muscle to function is not being met due to decrease in available blood. This leads to the muscle not having the ability to form energy, remove metabolic wastes, etc. Your body, in an attempt to help itself then begins to replace muscle, a very oxygen-needy tissue, with scar tissue, which does not require oxygen to function. This scar tissue binds up and ties down tissues that need to move freely. As scar tissue builds up, muscles become shorter and weaker, tension on tendons causes tendonitis/tendonosis, and nerves can become trapped. This can cause reduced range of motion, loss of strength, and pain. If a nerve is trapped you may also feel tingling, numbness, and weakness. I find that patients who present with these wrist symptoms (as long as there is no fracture) do well with wrist adjustments, mobilizations and soft tissue therapy to the forearm and wrist. What do you mean by adjustments and mobilizations? An adjustment and mobilization is essentially performed to move the carpals back into place or to get them properly moving again – to eliminate dysfunction. Soft tissue therapy is great to relieve the tight muscles in the surrounding area. Furthermore, wrist exercises work well to get those carpal bones moving again. Squeezing a squishy ball or putting an elastic around your fingers and opening your hand works both the flexors/extensors of the forearm. I hope you enjoyed this blog today. Please provide feedback and comments. Thank you.